This is the 6th and final book in the series. If you have been around our blog for any length of time, its safe to say you know we have a little bit of an obsession with all books Jillian Dodd, but especially The Keatyn Chronicles! What started as a guilty pleasure has turned into a fantastic journey! 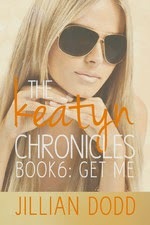 If you have not read the first 5 books in the series I am begging and pleading with you to go one click them NOW! They are so good its sinful. I know I should not get caught up in the teenage world, but for the life of me, I just can't help it. And if you haven't read them, do not read anymore! Get Me begins like all the other books in the series, exactly where the last one ended. So, you know Keatyn told some half truths to the students at Eastbrooke in order to protect Peyton. Talk about a great friend! Oh, did you think I was going to go into detail about what happens next? Did you want me to reveal Moon Boy's identity? Well, sorry to disappoint but I'm not giving anything away. Don't get me wrong I really, really want to shout it from the rooftops and tweet all about it, but I can't. And let's be honest you don't really want me to because then it would completely ruin your experience with Keatyn in her final chapter and nothing is working ruining such an absolutely, over the top, completely perfect ending! What I can say is this: Jillian Dodd is pure genius. The final book in Keatyn's story was everything I hoped it would be and more than I imagined it would ever be. Yes, you obviously find out Moon Boy's true, on and only identity, but there is so much more to Keatyn's ending than just the name of a boy. You see Keatyn happy, confident, grown up. No longer is she a girl trying to figure out who she is and what she wants. She's a woman, her life has taken her down paths she never imagined and allowed her to figure out who she is at her core and what she wants out of her life. No longer self doubting and trying to fit in, Keatyn knows what she wants and isn't afraid of going after it and she's truly genuinely happy. The Epilogue has to be one of the most perfect epilogues I have EVER read. Pick up this book and get started. Just do it when you don't have plans, because you will not want to put it down. And when it is over, you will want to start the whole series all over again!